Olympic champions Germany beat Great Britain 2-1 in their Nations Cup match at the Queen Elizabeth Olympic Park. The Germans scored two goals in less than a minute in the third quarter to seal victory. Britain had taken an early lead through Wimbledon's Alastair Brogdon in front of a sold-out crowd in east London. 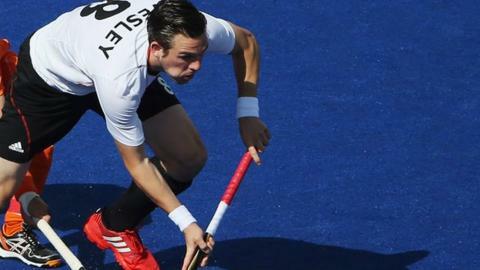 But goals from Mats Gambusch and Olympic gold medallist Christopher Wesley prevented a first win for Great Britain over Germany since 2000. Played across the new international format of four 15-minute quarters, the first quarter was evenly matched. Germany had just one shot on target, cleared by the foot of British keeper George Pinner. In the second quarter Britain's pressure led to a clean hit high into the net by Brogdon to give them the lead. But they lost control of the match in third quarter. The first German goal came from a penalty corner - after Pinner had saved the initial shot, Grambusch scored the equaliser. Their second came from open play as Wesley flew down the right wing to lift over the ball over Pinner's head and find the target. With less than two minutes remaining in the match, Britain's head coach Bobby Crutchley took off Pinner in an attempt to gain the extra attacking advantage. But Germany saw off the threat to hold on for the victory. A capacity 3,000 fans watched the match at the The Lee Valley Hockey and Tennis Centre. In the build-up to the match, speculation centred on the possible British debut of Beeston midfielder David Ames. A first appearance would make him the third Irishman to switch allegiance after GB regulars Mark Gleghorne and Iain Lewers. However it was revealed by management that his paperwork was not yet complete.